Plugfones offer hearing protection and music at the same time. Engineered to help protect your hearing, Plugfones function like traditional earplugs, but with the added benefit of audio. Listen to audiobooks and music while you work with Plugfones. Plugfones are great for those working or recreating in noisy envrironments who want to protect their hearing while having the convenience of listening to music or audio. Plugfones feature a patented design that allows you to interchange and replace the tips quickly and easily. Each pair of Plugfones includes 1 pair of silicone tips and 1 pair of foam tips. We have found our customers have different preferences and even like to switch between tip types, depending on their activity. If your tips wear out, no problem! Plugfones sells replacement tips. Plugfones have been lab tested and offer an NRR rating of 25. Next time you go to work or mow the lawn, listen to some music or a book. Enjoy your time with Plugfones! DUAL PURPOSE: Plugfones Contractor offers ear plugs / earbuds in one. Plugfones offers optimal protection for construction and manufacturing environments while listening to you favorite music, sporting event or podcast. WHERE TO USE: Plugfones Contractor ear plugs / earbuds were designed for working in the field or in a factory, but are also great for any loud environment: shooting, target ranges, outdoor sports, etc. NOISE REDUCTION: Plugfones ear plugs have been lab tested and offer a NRR of 25dB allowing you to block out background noise while enjoying music with great quality sound. TOUGHNESS: Work environments are hard on any product. 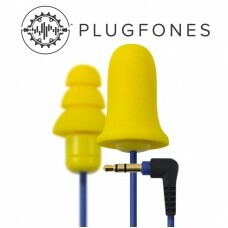 Plugfones produce ear plugs / Earbuds to withstand abuse. Manufactured with the strongest materials, Plugfones products won't fall apart while allowing long comfortable wear time. PREMIUM DESIGN: 1 Pair: Silicone tips. 1 Pair: Foam tips. (Orange) 1 Pair: 1.2 M flexible cable. Includes Silicone and Foam ear plug tips which can be used interchangeably depending on the desired fit. Compatible with all 2nd Generation and Liberate Plugfones products. In the late 2000s, we recognized a great need in many workplaces—people were required to wear hearing protection but wanted to listen to music at the same time. That’s why we created Plugfones. We’ve combined comfortable, noise-reducing earplugs with high-quality audio speakers. The resulting hybrid provides the ultimate hearing protection + listening experience on the market. At Plugfones, we believe that work should be enjoyed – so we created an earplug-earbud product to help you do exactly that. Our unique earplug tips surpass the quality of traditional earplugs and fit securely in your ear without falling out. Unlike traditional earplugs, Plugfones allow you to hear outside low-level noises while listening to music, audiobooks, or podcasts. In-ear noise reduction: You get the same silicone or foam earplugs to protect hearing + music! Plugfones have certified Noise Reduction Ratings (NRR) of 23 dB and 26 dB depending on the plugs used. Sound: Plugfones help make work enjoyable by allowing you to listen to what you want rather than your noisy environment. Almost all Plugfones models feature tuned speakers that emit fuller, more dynamic sound to complete your listening experience. Comfort: Comfort is key to choosing earplugs. Our earplug-earbud hybrids are designed to fit all ear types, keep you irritation-free, and be worn for hours at a time. Our soft foam and silicone earplugs are interchangeable and can be replaced when they become dirty or worn out. Innovation: Traditional earplugs are boring. Plugfones solve both issues of workplace boredom and the need for safety compliance in the workplace. Plugfones help ensure workers are protected from hazardous noise levels while boosting their productivity and morale. SoundSeal noise-suppressing technology minimizes environmental noise to give you an immersive, unparalleled listening experience. It acts as a barrier between you and everything you don't want to hear, creating an atmosphere singular to you and your music. Plugfones have been independently tested by Michael & Associates, Inc., a third party Nationally Recognized Testing Laboratory (NRTL). Michael & Associates, Inc. has rigorously tested our products according to U.S., E.U., and Australian standards. What are Noise Reduction Ratings (NRR) and Why Do They Matter? An official Noise Reduction Rating (NRR) is a certification of the number of decibels a noise level can be reduced by the proper application of the device or item being tested. This rating is provided so that the consumer can choose a device that will help prevent hearing loss given their normal activities and usage. According to the Occupational Safety and Health Administration’s (OSHA) occupational noise exposure standard (29 CFR 1910.95), workers should wear personal protective equipment to prevent hearing loss when exposed to 85 dB or more over eight hours. The National Institute for Occupational Safety and Health (NIOSH) recommends the same, estimating that four million people work in hazardous noise levels every day. To help protect and educate workers, both organizations have a variety of resources available, such as the OSHA Technical Manual on Noise and the NIOSH Guide to Preventing Occupational Hearing Loss. To understand how Noise Reduction Ratings help you conserve your hearing, imagine you were standing next to a bulldozer with a noise level of 94 dB. When used correctly, Plugfones with an NRR of 26 dB can reduce the noise level from 94 dB to 84.5 dB, which falls below the potentially hazardous level. Learn more about how to calculate and use a NRR by referencing the OSHA Technical Manual on Noise, Appendix E.
Which NRR is Right For Me? Every activity or workplace has a different level of noise, but averages for certain types of activities can be referenced through an online list of noise databases provided by OSHA. Please see OSHA’s 29 CFR 1910.95 standard for more information on selecting hearing protection. While it is fun to listen to music or audiobooks on your earplug-earbud hybrids, Plugfones does not condone or encourage the abuse of corporate safety rules or OSHA regulations. If your workplace does not permit the use of our hearing protection products, Plugfones is not responsible if you use our products to violate company policies. We understand that most of our customers use their Plugfones in rough or hazardous work environments, and while our products are made with the highest quality materials, they are not indestructible. While working, we recommend you protect your Plugfones by handling them with reasonable care and storing them in a clean area. For safety, consider threading cables through your clothing to prevent them from getting caught on objects.